With all the buzz surrounding Millennials, marketers should keep their eye on Latina moms. This influential demographic controls the majority of Hispanic purchasing power, is growing in numbers, and is looking for content that is tailored to them. Latina moms control the lion’s share of the $1.2 trillion Hispanics will spend each year. According to Nielsen’s 2013 “Latina Power Shift” report, 86% of Latinas say they are the primary decision makers in their households for categories including food and beverage, insurance, education and financial services.Couple this with the fact that 63% of Latinas have children under age 18 (compared to 40% for non-Hispanic white females), and the fact that Latinas are expected to become 30% of the total female population by 2060, and you have unlocked a golden market. Batanga Media’s “Latinas and Online Content Study,” conducted by Nielsen, reports that Latinas believe lifestyle content helps them be more successful. They actively seek opportunities to educate, entertain, and empower themselves, and they don’t stop there. They also create and share content with their connections. Connections are important to Latinas by nature —and digital media is the perfect vehicle to keep her connections alive and thriving. These connections allow her to not only to stay close with relatives and friends from her country of origin, but also to build affinity groups within the U.S.
To connect with Latina moms you must speak her language, identify with her experience, and seek her out where she spends most of her time online. The answer to the question, “What language do Latina moms speak?” is simple: both. The Latina mom chooses Spanish while embracing English at the same time. Bilingualism is her way of life as we discussed in this post. Everyone wants to be heard and understood, and Latina moms are no exception. When writing for her, think of the many roles she plays in her daily life. She is her family’s CEO: a mom, wife, coworker, and next-door neighbor, all while also managing the complexities of living in constant balance between two cultures. Acknowledging the differences among Latina moms is also an important aspect of identifying with the group. Yes they are all Latina, but they come from different backgrounds and have different traditions. Recognizing these individualities will pull them in, while appearing unaware of their diversity can alienate them. 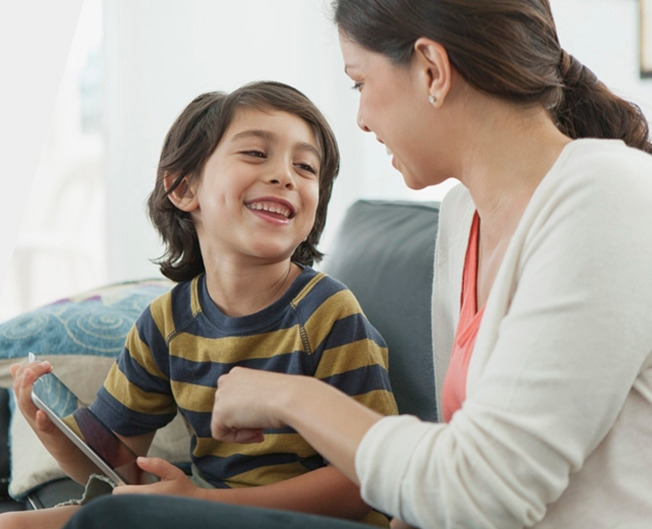 Latina moms live in the digital world, specifically on mobile devices. As Nielsen reports, “Online Latinas are more likely than their non-Hispanic white counterparts to own smart phones at 77% (vs 55%).” You can reach her at the palm of her hand! When she has time, she picks up her phone and actively participates on social media sites where she can interact with a community that shares her cultural interests. She is also seeking content that can help her make informed decisions about products and services. Brands have a tangible opportunity with Latina moms through online content. The Batanga Media study reports that 62% of Latinas wish more lifestyle information was written “for Latinas like me.” Their life in the digital world not only informs their purchasing choices but also fulfills their need to share and recommend what they like. It is also a market that is on the rise and the desire for Hispanic-specific content continues to grow. They are asking for it and brands that deliver on their needs will prosper.